Your generosity helps us support all generations! Our libraries are so much more than our best-beloved books – they’re cornerstones of communities! And we love being a place where people of all ages, backgrounds and needs connect with one another, learn new things, discover new interests and get started toward exciting paths ahead. That’s why, this spring, we’re teaming up with the Jefferson County Library Foundation to celebrate the wonderful services and community resources our Libraries offer. We’re participating in the first-ever national Library Giving Day campaign on Wednesday, April 10. Library Giving Day is a one-day online fundraising opportunity for Library lovers from all walks of life to show their love for the Library. Together, we can help keep JCPL a vibrant place for everyone to learn, grow and succeed. Library lovers can make a contribution to the Library Foundation online through a unique portal on ColoradoGives.org now through Saturday, April 13, 2019. Through this portal, you can submit an e-check, schedule your donation or even set up a recurring donation for the rest of year. There is a $10-minimum donation required to participate. Donations by mail may be sent to Jefferson County Library Foundation, 10790 W. 50th Ave., Suite 200, Wheat Ridge, CO 80033. To schedule your donation in advance online, select “Recurring” as your “Donation Frequency.” Then, set your donation to “End after number of payments.” For a single payment, type "1" in the box. This spring, join the #LibraryGivingDay celebration! Thank you for being a Library champion! 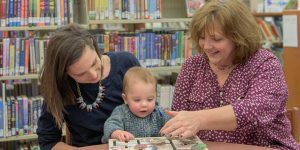 The generosity of individuals like you helps us keep Jeffco Libraries strong. We are so grateful for you and your continued support!